For the past few weeks, all you’ve heard about is our 2013 SLP Camaro with its brand new B15 engine and SLP 2.3L supercharger. Little did you know that behind the scenes, our team has been working on the new supercharger kit for the 2014-2015 GMC Sierra and Chevrolet Silverado (and GM SUVs) as well. Our skilled team of calibrators is working to develop and engineer the best power adder possible for your pickup truck, keeping in mind durability, compatibility, and of course power. Bits and pieces have begun to trickle through and land themselves on our 2014 GMC Sierra SLP Development Vehicle. Keep it locked right here for more as this project progresses. 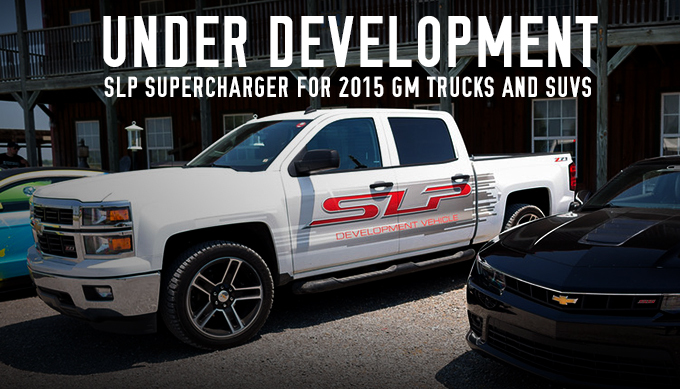 In the meantime, check out our superchargers for 2013 and earlier GMC Sierras, Chevrolet Silverados, and GM SUVs. We offer them for both the 5.3L and the 6.2L, and can promise 450 horsepower and 520 horsepower respectively. Keep in mind that our supercharger kits retain a 3-year/36,000-mile warranty on all supercharger components, and are 50-state legal (EO# D-187-21).